To become a successful trader, it’s not only important that you get your chart analysis right. You also have to pay close attention to your risk and money management guidelines. Even the best trading strategy in the world won’t be of much help if you neglect your risk-per-trade, reward-to-risk ratios or position sizing – some of the most important concepts of money management in Forex. In this article, we’ll take a closer look at risk reward ratios and explain their importance in trading. We’ll show you how to calculate R/R ratios and how to determine the best ratio to increase your trading performance. What is Risk Reward Ratio in Forex? Risk reward ratios are one of the most misunderstood concepts in Forex money management. Many beginner traders start to understand their importance only after they blow their trading account or experience a series of losing trades. Why do so many traders lose money in the market, despite analysing the market properly and having a high winning rate of their trades? One of the most common reasons is neglecting the reward to risk ratios of the trades. The reward to risk ratio of a trade, or R/R, is simply the ratio between its potential profit and its potential loss. Imagine a trade that has a 100 pips stop-loss and a 100 pips profit target. What would be the reward to risk of that trade? If you guessed R/R=1, you were right. If we don’t take into account the spread, the trade would have a potential loss equal to its potential profit. Now, let’s imagine a trade that has a 100 pips stop-loss and a profit-target of 200 pips. The reward to risk ratio, in this case, would be 2 (200 pips / 100 pips), i.e. the potential profit of the trade is twice as large as its potential loss. You might ask why all traders wouldn’t simply embrace trade setups with higher reward to risk ratios. It’s more difficult for the price to reach a higher profit target if its stop-loss level is tight. A trade with a reward to risk ratio of 10:1 has a much higher chance to hit the stop-loss level than the take-profit level. Traders need to make sure that their trades have enough breathing room to withstand negative price fluctuations. At some point, almost all winning trades will be in a small loss before going in your favour. Why is Risk Reward Important? Besides increasing the success rate and profitability of trades, risk reward ratios are also important for another reason. 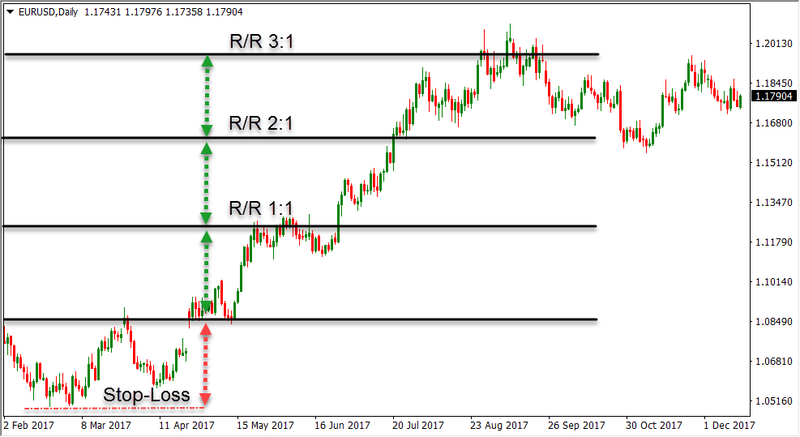 Let’s take the two trade examples from above – the first setup with a reward to risk ratio of 1, and second setup with a reward to risk ratio of 2. A trader has an average winning rate of 50%, i.e. half of the trader’s trades are winners, and half are losers. Over a large enough sample of trades, the trader would be much more profitable with the second type of R/R. If each trade can potentially lose as much as it can win, you would need a winning rate of 50% only to break even, and that’s without taking spreads into account. On the other side, trades with R/R ratios higher than 1 potentially earn more than they can lose. If you opened two positions with a reward-to-risk ratio of 2, you’d make a profit even if one of the trades hit your stop-loss level. How to Calculate Risk Reward Ratio in Forex? So far you know that the reward to risk ratio of a trade is simply its potential profit divided by its potential loss. However, how to make sure that you identified the right take-profit and stop-loss levels for your trade? Also, what reward to risk ratio is good enough to take a trade that has a good technical setup? Step 1: Determine the Best Place for a Stop-Loss – The first step you need to do is to find the perfect level where your stop-loss order should be placed. There are four main types of stop-loss orders, including chart stops, equity stops, volatility stops and time stops. While chart stops, which are based on important technical levels on the chart, have shown to be the most efficient type of stop-loss orders, you can also use other types depending on your trading strategy. 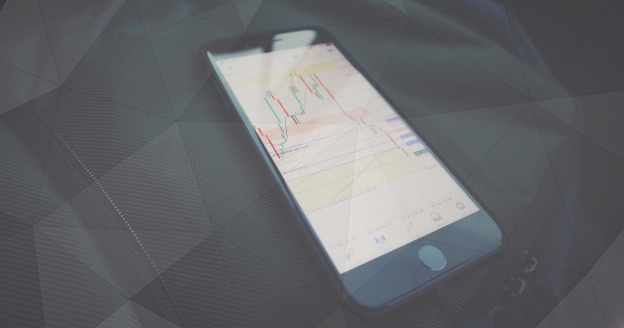 Step 2: Set Your Profit Target – After you’ve found the best place for your stop-loss, it’s time to analyse the chart for the best profit target. Again, just like chart stops, profit targets that are based on important technical chart-levels have shown to return the best results. In this step, make sure that your desired profit target is at least equal to the size of your stop-loss level, i.e. if your stop-loss is 100 pips, look for profit targets that are at least 100 pips away from the entry price. This will ensure that your reward to risk ratio is at least 1. Step 3: Divide Your Potential Profit with Your Potential Loss – Now that you have identified potential stop-loss and take-profit levels, you need to divide them to get the reward to risk ratio of your trade. What is the Proper Risk to Reward Ratio? Most traders have a winning rate of more than 50%, but they still lose money. One of the most notable reasons is the reward to risk ratio of those trades. Despite the fact that traders are correct most of the time, they lose more on losing trades than they make on winning trades. The following chart shows the percentage of trades closed with a profit, grouped by currency pair. Still, the profits on each winning trade were much smaller than the losses on losing trades. To increase your profitability, DailyFX Research Team suggests adopting a reward-to-risk ratio of at least one. The higher your R/R ratio, the less often you need to correctly anticipate future price-movements to stay profitable. Trades with R/R ratios of 2:1, 3:1 or even 4:1 have shown to be the most effective setups in the market. In addition, make sure to include your desired R/R ratio into your written trading plan. Traders tend to trade based on emotions if they don’t have a written plan to which they can refer to when times get tough. The reward to risk ratio of trades is one of the most important concepts of money and risk management in trading. The R/R ratio refers to the ratio of the potential profit and potential loss of a trade. If you’re new to trading, make sure to adopt a healthy trading habit of looking for setups that have a reward to risk ratio of at least 1. The higher the R/R ratio, the less often you have to be right in forecasting future prices to make money trading. Even with a 50% winning rate, you can make a profit in the market if you only take trades that have an R/R ratio of at least 1. Many traders achieve even higher win rates, but the R/R ratios of their trades are holding them back to make money in the long run.